Summer of Love in London Town. 'That's Adam Clayton there. First manager of the U2. We wouldn't be anywhere without him. That's Larry Mullen Jr... He started this band…' A memory that took us into Summer of Love, two kinds of vessels afloat on the horizon of the Mediterranean, a song that looks back and takes us forward. Opening night in London and a whole show of experience in search of innocence. After Beautiful Day, memories of those first visits to this city - and to others in Europe - took us into Zoo Station. 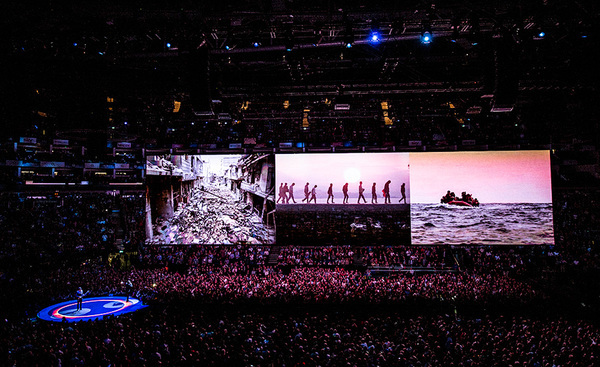 @Andy_Turner_ (via Twitter) A U2 show is like nothing else, pop meets performance art. Passionate, raw, hopeful, political. Tonight was exhilarating, up-close with a tender dedication to Eugene Peterson. Reminded me of the film of when the two met. Were you in the 02 tonight ? Post your reviews and add your photos here.